The following is drawn from an autobiography written by the Rev. Daniel Iverson, founding pastor of the Shenandoah Presbyterian Church in Miami, Florida. That church closed its doors some years ago, but the legacy lives on. The Shenandoah Presbyterian Church in its first twenty-four years under Daniel Iverson grew from seventeen worshipers in an old dance hall (half of them Iversons) to 1664 members with a Sunday School of 1200. 150 went into full-time Christian ministries, 4000 persons made a public profession of faith joining Shenandoah and her missions in this period, and some twenty-one churches were founded through Shenandoah and its pastor, together with its “children and grandchildren. 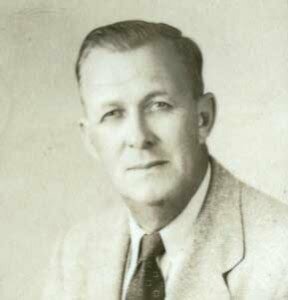 With the vast shift of population, seventy five years later, the Calle Ocho Church began to replant the church, “Reformed according to the Word of God” in the heart of what is now known as “Little Havana.” This autobiographical sketch in Dan Iverson’s own words best explains the miracle of Shenandoah. It is a simple answer. Obviously, God did it! In February, 1927, Mrs. Iverson and I began to visit from home to home in the Southwest section of the city to see about prospects. The people were in such an unsettled condition due to the collapse of the business boom and the terrible hurricane, it looked like a hopeless task. We were greeted with more or less indifference. We did not have a place to worship, and did not know where we could secure such a place; but we felt it was God’s will that we should work as though everything would work out alright, trusting Him every step of the way. We found some people suspicious, charging that we had an ax to grind. We found some very receptive and interested, and that most of them had heartaches they were trying to hide. Having had some experience with people (Dan was about thirty eight years old), we felt it was our duty to penetrate the crust that hid the real self, and be of comfort and service to those in distress. Having felt it was the time to start the church in the Shenandoah community, I put notices in the newspapers, inviting those who were interested in establishing a Presbyterian Church to visit us in our home on a Tuesday evening in late February. About eight people attended that meeting, but only one became a member of what is now known as the Shenandoah Presbyterian Church. After visiting for several weeks, we had interested enough folks, we thought, to jusify our finding a place of worship. There was an apartment on the corner of Southwest 20th Avenue and 12th Street that had stores on the ground floor. We thought that was the place to begin, and tried to secure one of the stores. The owner of the building said that if we could gain the consent of those in the apartment building, we could use the store for a short time. After four days, we had the people’s consent, but then the owner of the building decided against it. This was discouraging, for we had tried several places and met with similar rebuffs. 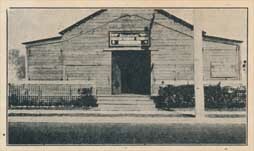 On Tamiami Trail and 20th Avenue there was a wooden building, now very much dilapidated, but then being used as a dance hall. It did not look to be the right thing to start a church in a Dance Hall. I found the building open, and walked in to take a look, and found it ideal as a Tabernacle. I felt God had led me to this place. There was a little orchestra stand in the center of the building, and I knelt down behind the stand and claimed the building for God, and as I knelt and prayed, I felt God had answered my prayers. I did every thing I could to secure this building, but failed. Yet I felt in my heart that it would finally be ours. I kept looking around the area and found an open air theater, now known as the Trail Auto Parts Company, that had closed its doors as a moving picture concern. I felt it was an unwise move to begin, but feeling it was imperative, I was ready to accept anything. I secured this building for ten dollars per Sunday, and did not have the ten dollars to pay it. That week, having printed ten thousand invitation cards, my two boys, Dan and Ned, and my little girl Ella Lillian, went with me and assisted me in placing under the doors of 1000 homes these cards. This interested them in the venture, and I found in family prayers they were constantly remembering this effort before God. Having given out one thousand cards, they thought everyone would respond and expected to see a large gathering on that first Sunday, March 13, 1927 at the Kew Garden Theater. We advertised the Bible School hour at 9:45 A.M. I painted a sign and placed it outside the door, and opened up at 9:00 AM. There were five from our own family present, At 9:45 there were still just five present, and that was a matter of anxiety for us all. As we were beginning with just our family at five minutes of ten, one person strolled in and asked if this was the place for the service, and wondered where the crowd was. At five minutes after ten, there were possibly ten present, and by 10:15 AM we had our first Sunday School of seventeen people divided into three classes. These classes were led by Mrs. Jennie Anderson, and for the adults a class by Mrs. Daniel Iverson, and one by Miss Alice France. The open air theater had a concrete floor and sunshine rules very strongly in Miami in March. It was unbearably warm and the glare very hard on the eyes. We found we were laboring under tremendous hardships. After a brief Sunday School session of the three classes, we asked the people to stay for church, and we would not keep them long. Some people were added to the eleven o’clock service, making the attendance perhaps twenty-five or thirty. The sun was so hot that the people complained about it. I suggested we hold a short service and someone suggested that they go home and get their parasols and come back. I was afraid that if I let them go, they would not come back. They were so nice and kind, I gave them their wish and everyone came back. This was just a little thing, but that was an encouraging thing, and I needed that little encouragement at what seemed to be a very dark moment in the blazing sun. We had no hymn books, but I found a friend from my home town that was kind enough to make a couple hundred copies of three hymns. We used those hymns for a number of weeks for we had no funds with which to purchase hymn books. During the following weeks I felt it necessary to get another place of worship, but found it impossible to secure them. So I printed one thousand more cards and with some neighbor children and my own, we placed cards under the doors again. I know we were not as welcome as we ought to have been, but I overlooked that, and went on. In spite of the handicap of a very uncomfortable place, we had a slight increase of both Bible School and Church. On these cards we suggested that people bring their parasols, and they did. We prayed earnestly that God at that time would answer the prayers for the dance hall. Another week went by with the same disappointment and fear, but again, there was a slight increase in attendance. When the Lord has a work to do, He prepares the way. Nothing will prevent or hinder the accomplishment of His will. It will happen in His time. Our role is to watch, and to faithfully obey, as He leads. The Gospel must be proclaimed. God will do the rest. Interesting Church 2 great evangelists, A. R. Stanford. founder of Florida Bible College and James Kennedy, Founder of Coral Ridge Ministries and Evangelism Explosion both served at Shenandoah.